The purchase of Louisiana was the most important event of American history in the first half of the nineteenth century. It doubled the area of the United States and brought under our rule one of the most valuable tracts of land in the world. Fourteen states have been created wholly or in part, out of the Louisiana territory. The population has grown from 50,000 in 1804, of whom half were slaves, to over 18,000,000 in 1910. The cattle and timber of Montana, the wheat of Minnesota and the Dakotas, the court of Kansas, and the sugar and cotton of Louisiana have been the source of rapidly increasing wealth to our country. By the census of 1900, the value of the farm property alone in these 14 states was 6,724,855,132, or four hundred and fifty times what we paid for the whole territory. At the imposing exposition held in St. Louis, the metropolis of the region, in 1904, to celebrate the one-hundredth anniversary of the purchase, the abounding population and prosperity of the states of the Louisiana Purchase were the admiration of millions of visitors. Furthermore, the acquisition of Louisiana stimulated the interest of the government in the vast territory to the west of the Mississippi River. 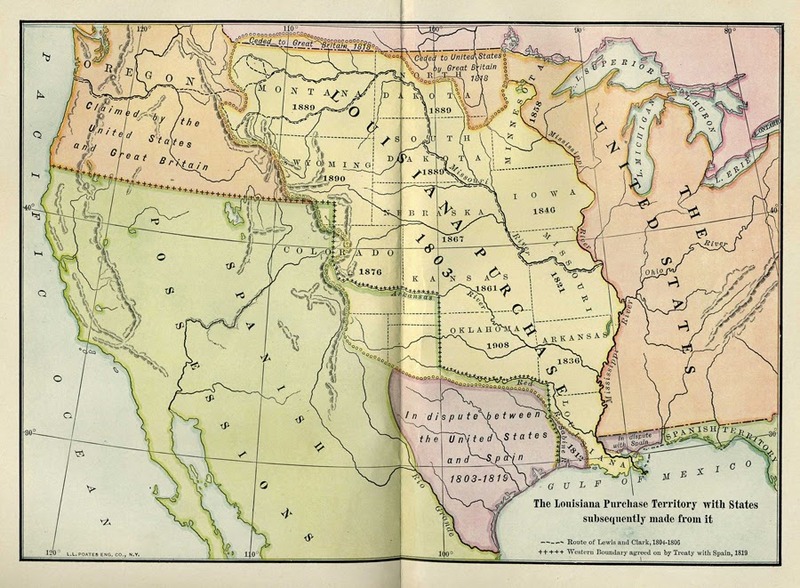 Less than two months after the cession of Louisiana to the United States, Jefferson commission Captain Meriwether Lewis, his private secretary, to head a scientific expert exploring party to the Far Northwest. Lewis associated with him. William Clark, younger brother of George Rogers Clark of Revolutionary fame. After wintering at the mouth of the Missouri River, the Louis and Clark expedition started westward in the spring of 1804 with the company of thirty-five men. They ascended the Missouri to its source, crossed the Rockies, and descended the Columbia River to the Sea, making important studies, in their two and a half years’ journey, of the natural features of the country and the habits of the Indian tribes. Their remarkable expedition was an important factor in our claim to the Oregon country in our dispute with England forty years later.